why is he so angry? Yeah, we all know that Rush has a secret army just waiting to annihilate a complete race of people. Your comparison is from an evil mind. I often listen to talk radio and sometimes listen to Rush for several minutes. When I listen to his presentation rather than his words, I am reminded of Hitler’s nonsensical rants. 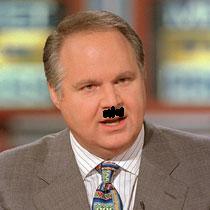 Of course Rush is much different than Adolf. Adolf was a drug user, lived in luxury, believed he was on loan from god, and was in favor of invasions and torture.